It is my pleasure to welcome you all back to Beverley Hills JFC for the 2019 season. For those families new to the club and our ”Auskickers” graduating into Junior Football we extend a special welcome. Our Auskick programs held on Friday, Saturday and Sunday are critical to the growth of our membership and we thank all those parent leaders of this program in past years. 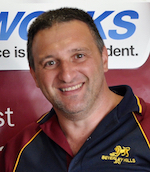 This year we have appointed a new Auskick coordinator Anthony Pezzimenti to the role following on from Pat Cooper who we sincerely thank for his outstanding service to our club. We hope you all enjoy becoming part of the Beverley Hills family and community. This year will be another exciting year as we continue to grow our club and its boy and girl participants and our reputation as one of the most professional junior sports clubs in the community and in the YJFL. In January 2019 the AFL renewed our AFL Gold accreditation which is a testament to our excellent administration, coaching and structures in place and we are only club in the City of Manningham and Yarra Junior Football League accredited at this level and one of only twenty eight in Australia. Our Executive would like to sincerely thank all General Committee members, parents, players, sponsors, supporters of our great club.as we aim to continue to build upon the solid foundations of those who have come before us to ensure that our traditions and values remain strong. There is a great spirit and family atmosphere at the club which serves a greater purpose than just the children playing football. Our community and social responsibility values and programs have seen us set the benchmark and we continue to foster terrific council and sponsor support partnering with our long term sponsors Bendigo Bank Doncaster East and Templestowe, Phillips Foundation, Concept Logistics, Barry Plant Manningham and introducing our newest Gold Sponsor Diamond Creek Panels who have replaced our previous sponsor LP Bodyworks who ceased trading this year. Beverley Hills is administered by some committed and talented volunteers and it is important that this group is continually expanded upon year to year to keep the club moving forward and progressive. There are numerous ongoing and other roles many opportunities at the club for volunteers to become involved and make a difference and I would welcome all parents willing to contribute further to our great club to contact me. Without volunteers the club cannot run and our kids can’t play so if you are required on match day or otherwise please get involved. Coaching – Continuing mentoring of Anthony Phillips and Brett Chandler to provide coaching advice and expertise to oversea our club coaches. Rick Irwin also provided personal development kicking program sessions also for coaches and then individual teams. Going forward the club will continue to invest in coach education with particular emphasis on our players skill development and game sense as focus areas. Facilities & Equipment – Proud to be a partner with the Manningham City Council in obtaining an AFL pledge of$90,000 for Reishecks Reserve for Pavilion and Ground upgrade of over $900,000 which will be utilised within the next 12 months. Our expectation is to utilise Reischecks Reserve to ensure our forecasted player and team growth at BHJFC can be accommodated. Media - Our social media exposure which provides us with another level of interaction with our “BHJFC family” is second to none as we provide constant club news, player achievements and club information on all platforms including Facebook, Instagram, Twitter Team App and our Website. Recruitment – Our recruiting went up a gear in late 2017 early 2018 where we extensively targeted school recruitment within our catchment focussing on our main feeder schools in Milgate Primary School, Serpells Primary School, East Doncaster Secondary College and East Doncaster High School. Our clinics focussed on participation and inclusivity where we promoted not only our club but more importantly the game to over 1000 boys and girls in our local area. Bendigo Bank Enterprise Foundation funded these programs as they have done over the past eight years via annual community grant and we must thank them again for being involved and for their endorsement of our programs and valued outcomes on our youth. Key Corporate Sponsor and participant at the Milgate Primary School Fete where our Christian Petracca made a guest appearance. State School Victoria Girls day at Bulleen representation with Brad Harris coaching the Milgate team. Numerous AFL player community engagement appearances from Collingwood players; Darcy Moore, Tom Langdon, Callum Brown, Josh Daicos and our BHJFC boys Sam Mclartyand Tom Phillips. Proud Supporter and contributor of BHJFC footballs for football clinics for refuges in the Congo in Rwanda with corporate partner Phillips Foundation, Reclink and Tom Phillips in their charitable work overseas. Numerous 50/100 game milestones throughout the year including our first girls Lauren Cresp and Petra Edwards and Madison Buszano playing their 50th games. YJFL Colts Under 16 team selection for James Menta, Adam Heward, Amber Micallef, LilyHarris and Alexandria Cardamone. Clearly from the above this was Another BIG YEAR with more to come in 2019. We hope you enjoy 2019 and beyond.